The breed was started about the year 1900 in northwest Germany and especially in Lower Saxony. The existing swine supplied the original seed stock and improvement was made by farmer breeders through careful selection. During the years of 1948-1958, there were importations of Danish and Dutch Landrace that were used to further improve the breed. German Landrace appear much like the Landrace of other nations, especially those from which they imported stock. They have been selected for meatiness and are not as extreme in size and length as some of the Landrace strains of other nations. The color is white and the ears are heavy with the characteristic Landrace droop. Selection efforts have been especially directed toward excellent fertility, heavy milking and good mothering characteristics. There has been special aftention, following weaning, to efficiency in feed conversion and to high cut-out values. 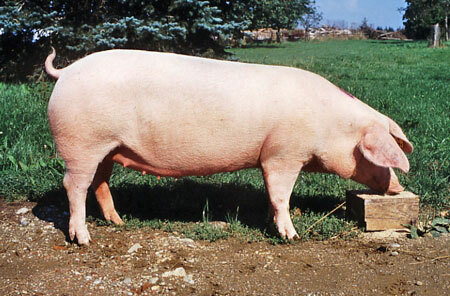 German Landrace have proven very useful in crossbreeding and in improving the general performance of swine in Germany. About 1,000 head are exported each year to other countries. German Landrace B are quite similar to the strain not designated by the letter. They are, however, kept separate in the herdbook. The B strain was started in 1970 at Pfaiz, Rhineland, from imported Belgian Landrace with some intermingling of Dutch Landrace breeding. Representatives of the strain have wider backs and especially more developed hams than the more numerous Landrace of the country. This makes them especially useful for crossbreeding. They are, for all practical purposes, another strain of the Landrace that gives a broader genetic base to commercial production.